I wouldn’t have thought about checking for a BIOS update. Found a tip online, but then couldn’t find it again to give credit. exactly what I was looking for. Never updated BIOS before, but took the risk. Very easy and straight forward. Thanks for the link. Didn´t need to update the video driver. Thanks so much. This was excellent! I tried to upgrade to Windows 10 and could not imagine why I kept running into this brick wall. Your solution worked perfectly! thanks for the tip…its just worked fine…..got the display working after updating BIOS>.. Thank you from the netherlands. That’s exciting! I’m glad my blog post helped. Same problem here. The different is I get a Dell 1525. After I upgraded to Windows 10, black screen occurs. God, that really drove me crazy. You know I am not an experienced computer user. It was a little difficult to find the compatible video driver for me. Then I asked help on some forums including Reddit and Microsoft… Someone told me Driver Talent could be helpful to verify if the drivers are outdated or not. I followed the instruction. God bless me, the problem was resolved finally. :) I am so glad to read your post as I learned something. Thank you. Question: after the BIOS update I’ve notice my screen seems to refresh itself every 30 seconds or so does anyone else have this problem? I haven’t seen that, sorry. I have the same issue with the black screen. How do I connect an external display? Do I just connect another monitor to the laptop? Yes, that’s what I mean. Your laptop will have a VGA or HDMI port where you can connect a monitor to help troubleshoot. I have tried connecting a monitor to the laptop but it doesn’t seem to be getting a signal from the laptop? Not sure what I’m doing wrong? I’m sorry, but I can’t troubleshoot it remotely. It could be a bad motherboard, or maybe you just need to press the Fn button and F8 or whichever button switches between the internal and external displays. I have now upgraded two similar but not identical 3550 to Win10. The second one showed the Black Screen problem exactly as described by you. BIOS update from A03 to A12 worked fine for me. Thx! I might also have a solution for Keith. On both of my Vostros I had to deinstall the Intel IDT audio driver ( from the apps overview in control panel) . This solved an annoying problem with always restarting display process. The Icons from Windows taskbar dissappeared every 20 sec or so and the whole display became black for a second. Thanks, Marc! I’ll make sure Keith sees your tip. Maybe try pressing FN + F1 to cycle through 4 modes of internal/external monitor enable/disables? Hi.. I’m not as tech savvy as all of you. I’m trying to update the bios as Karl indicated, but I dont know how I go about doing that..
Do you have a Vostro 3550, or a different model? If you don’t know, can you read the service tag on the bottom of the laptop? I’m having trouble flashing the bios with the dell 3550A12.EXE file on a USB. Any thoughts? Are there any other file types I should get? And where can I find those? The exe has always been the easiest way for me to flash the bios. One thing you might try (if the machine will boot) is to copy it to the machine before running it. If the display is black, plug in an external monitor. Thanks Karl. I ended up doing just that. Connected an external monitor, display was then view-able, and then simply ran the .exe in Windows. The computer restarted and I disconnected the external monitor and all was well! Thank you, you saved my life! So i need to update my BIOS version ? That’s what fixed the problem for me. Worked perfectly for me. A12 is a winner for a Vostro 3550. Now having an issue with explorer.exe though… that’s the issue with the screen refreshing every 30 seconds or so. Trying the latest build of Win10. Hi, thanks for solution! W upgraded my dad’s laptop via Team Viewer to Win10 and I had no idea why I could see properly working computer on my remote screen and there was only black screen on the laptop. If I’m stuck on the black screen, how am I able to do the BIOS update? If you have the same problem that I had, your laptop is working fine, you just can’t see the screen. You need to borrow an external monitor from someone, and then you’ll be able to see to install the BIOS update. Hi, I just thought I would leave a comment here. I had a client who had a screen that was refreshing every 30 secs and it was not allowing me into the control panel. I clicked start and typed programs and entered the programs feature in control panel. I uninstalled the IDT audio and rebooted the machine and after that it seemed to work fine. Fixed the issue with clean W10 installs on 2x 3550.
how exactly do i go about the bios update because i heard from an expert it could ruin my motherboard completely if done the wrong way. thanks Karl. am gonna give it a try. Upgrade my Vostro 3550 BIOS to A12 solved the issues for me. I updated BIOS with A12 and it’s working fine. I am using Windows 10 on Dell Vostro 3550. Karl, I have Dell Vostro 3350 same as you. I try to update BIOS but I can’t. System running on different system. And Only Cancel Button appear. I download BIOS and then running compatible on windows 8 also not worked. Now, I disable AMD display change winth intel no blank screen but the resolution is limited. I don’t know what to suggest. If you have any recent version of Windows running, you should be able to run the A12 BIOS installer. If nothing else works, you might try to find some Windows 7 install disks. Install Win 7, then update the BIOS, then try to get to Win 10. Karl, I’ll send pictures when I try to update bios. I run 3550A12, run as administrator. I close program and click OK button. Warning and then I clik Ok button. Dell BIOS flash windows appear with only Cancel button. What wrong with my procedures? You have a Vostro 3350, not a Vostro 3550. You have the latest BIOS for that model, A10. Djuki, I have the exact same problem. It’s mentioned absolutely nowhere else.. Have you found a solution? Dell N4050 BIOS was outdated, now my Intel HD 3000 with W10 Prof works fine. 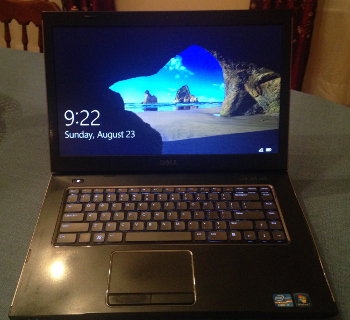 I have a Dell laptop Vostro 3446 with an with an Intel HD Graphics and NVIDIA GeForce GT 820M . After installing windows 10 , whenever i install intel hd graphics driver or windows automatically detects and download it, my pc goes to black screen as if graphic driver is unmounted , with a sound that comes when we unmount a device from pc. System still runs but there is no display. I almost tried everything , i could . I reinstalled windows and even completely formatted my PC with latest version of windows 10. but every time install intel hd graphic driver system goes to black screen. I have to boot it to Safe mode and uninstall driver, then pc reboots properly but with windows basic display driver which is not good. Later as soon as pc is connected to network it downloads driver and boom! black screen again. Believe me i almost tried every thing i could but failed and not able to use my pc from almost 4 months. Even lost my all data in all these process of frustration. Request you to please give me some advice or solution. It seems the intel driver is not compatible with windows 10. 1. Plug in an external monitor – it should keep working even when the built-in display goes black. Then you won’t need to keep rebooting into safe mode to see your display. 2. Maybe tell Windows update not to install the updated Intel driver, if you can, or update the NVidia driver after the Intel driver updates. 3. Try NVidia drivers from Dell and directly from NVidia. Really nice of you to reply so soon , thanks friend. As u suggested others , updating Bios wont work? I assumed that you tried a BIOS update first. I don’t know if you should expect it to help with the Vostro 3446. I just know that it did the trick for my 3550. If you haven’t checked already, check support.dell.com for a BIOS update and definitely install it if there is one. i wish you could help me out with this. My dell vostro 3446 already had latest a12 bios. I tried lot of stuff to fix black screen after graphic driver install, but couldn’t succeed. Then i installed windows 8, but the issue was same with windows 8 too. As soon as i install Intel hd display driver i see nothing but a black screen. I was totally frustrated and lost all hope , that i could ever use my laptop properly again. THEn i connected external monitor and restarted laptop. And then i saw , every thing is working totally perfect, but there is no output to monitor , rather my laptop display itself is working perfectly. As soon as i disconnect monitor , even my laptop display goes block with a window disconnect sound. That means my display graphic is working properly. But still if i disconnect vga cable it again goes black and even on connecting i am not getting display on external monitor , but laptop screen is itself working properly. please can you suggest anything. and what should i do now. Sorry, I don’t know what to suggest for this issue. I would try uninstalling and reinstalling the video driver, but it sounds like you’ve already done that. i have done almost every thing i could, i am trying to reinstall bios, lets see if it works. Thank you Karl. It works for my 3550. Yea it was, just one question, did all your drivers update automatically? Or did you update them manually? It was a long time ago, but I think most devices just worked and I had to update one or two.